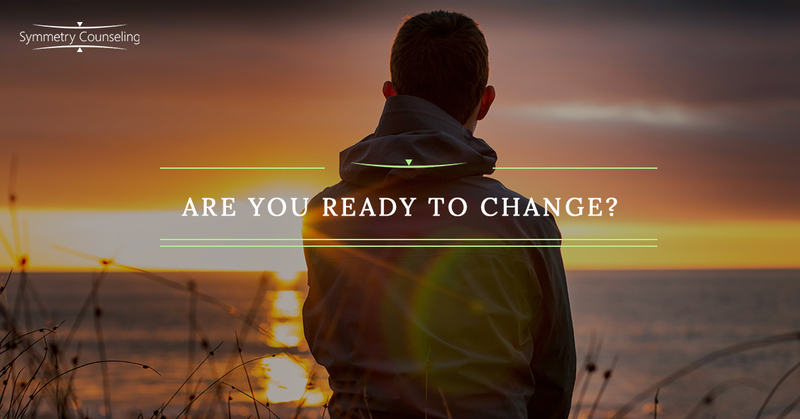 How Ready Are You to Change? Change is a process, and certainly not an easy one, but the benefits of making positive changes will almost certainly outweigh discomfort felt during the process. We are not, however, always prepared to dive into making changes, or are even able or ready to see that we could benefit from changing. Before attempting changes, it is useful to be able to identify how ready we are to begin to make them. This can be done utilizing the Stages of Change. The Stages of Change can be applied to a broad range of behavior changes, from compulsive and addictive behaviors, to enhancing motivation, increasing productivity, helping with anxiety or depression, and making difficult decisions including changing jobs or ending relationships. Identifying how ready we are to make changes, (or if we are even ready to make changes) either in therapy or outside of it, is key to learning and utilizing tools to reduce ambivalence, increase motivation, and make plans for changing thought and behavior, as well as how to respond to any lapses along the way to achieving lasting changes. Pre-contemplation: We have no motivation to make changes because we are unable and/or unwilling to acknowledge that a problem even exists. Many refer to this as denial. Contemplation: We have grown aware of the problem but are unsure about whether we are ready and willing to attempt to make changes, whether that is through therapy or other means. Preparation: We have decided we want to do something to change the problematic behavior and are beginning to brainstorm ideas as well as seek support, possibly from a counselor or psychologist, in developing a plan to make the change. Action: Having developed the plan for change, this is when we have put it into action. As we are actively engaging in thought and behavior change, we are regularly assessing the effectiveness of our plan to change, and altering it as needed. Many find the guidance of a counselor or psychologist through therapy helpful for this. Maintenance: We have made and sustained the desired change for a period of at least about 6 months. It becomes less difficult to sustain the changes, especially as the measurable benefits of the changes begin to accumulate. Exit: The behavior change has become part of our authentic selves. At this point, we may no longer require reinforcement through therapy and support from a counselor to sustain the changes we have made as we may have needed during the Maintenance stage. Lapse/Relapse: Not a stage on its own, the lapse or relapse occurs when there is some type of regression towards old maladaptive behaviors. It can be a momentary or sustained regression, but it is entirely possible to recover from this, and re-engage in achieving the changes towards which we are working. It is important to note that these stages do not necessarily follow a sequential pattern, meaning we may start at Contemplation, spend only a small amount of time in Preparation, and move quickly into the Action stage. Likewise, after a lapse or relapse, it is possible to re-engage in the change process at any point, including going right back into the Action stage. How do we feel about changing our behaviors? What might we do to make those changes? How important making these changes are to us? How confident we are that we will be able to make them? Seeking support increases our chances of answering these questions. Many resources exist, including professional help such as that offered by the therapists at Symmetry Counseling. If you are interested in making changes in your life, I encourage you to contact our practice to begin this rewarding process. Contact us online or give us a call to schedule a therapy session with one of our compassionate counselors today.